We have several users that need the ability to view, send and receive emails for different accounts. We can get everything set up correctly except for one piece. Anytime a person sends out an email it is sent from the wrong mailbox and also shows up in the incorrect sent box.... We don't have a selection of which account to send from. Delegates of shared accounts who can send mail on behalf of and have full control of all the folders in the shared account can save sent items and deleted items in the mailbox owner's folders. However, a registry key may need to be set. You need to use Cached Exchange mode for this to work! In all versions of Outlook, there are two basic ways to control where sent mail is saved for the secondary account. Assign the user Send as permissions then save the email to the secondary account's Sent Items folder using rules or a registry value, or add the second account as an IMAP account. If your mailbox is located on Exchange Server 2010 or newer (including Office 365 Exchange Online), the Exchange administrator can configure similar behavior on the server. Because this new feature is handled by the Exchange server, Outlook can be configured for Online or Cached Exchange Mode. However, the Exchange server feature only works if the Outlook DelegateSentItemsStyle registry value is disabled. See Save Sent Items in Shared Mailbox using an Exchange Server Cmdletfor more details. To save items in the Sent folder with the mailbox open as a secondary mailbox, you will either need to use "After sending" rules or a registry hack. Either way, your default Exchange account will need to have Send as permission and create permission on the Sent items folder. This applies to Deleted items as well. See Deleted items for the registry key. First, in the Active Directory, give the user's account send as permission on the accounts he needs to send from. The user then types that address in the From field (or click the From button and select it from the GAL) when preparing the message. Delegates with permission to send email on behalf of another user should have the correct permission already. However, SendAs permission will eliminate mail being sent "on behalf of" the mailbox owner. In the secondary mailbox, the user's account will need permission to create items in the Sent Items folder. This can be set from Outlook. Right click on the Sent Items folder and choose Properties, then Permissions tab. The user needs sufficient permissions to create items in the folder. With Outlook 2003, 2007, or 2010, the sent message can be moved to the secondary account's Sent folder automatically if a registry key is set and appropriate hotfixes or updates are installed. Users of all version of Outlook can use after sending rules or an add-in to move the sent messages to move sent items to the correct folder. While you can open secondary mailboxes Outlook 2010, you can also open the account as a second Exchange account. However, we recommend delegates use the "old" method of opening the shared mailbox as a secondary account in their profile. When the user has Full Access rights to the mailbox, the mailbox is opened in the profile automatically in Outlook 2007 and 2010. With all versions you will need to close and restart Outlook for the registry change to take effect. If you don't want to edit the registry yourself, I have ready-to-use registry files you can download and run to set the DelegateSentItemsStyle. If you need to know who sent the message, you can add the change by field to the Sent Items folder. To do this, right click on the row of field names and choose Field Chooser. Select All Mail Fields then find Changed By in the list. If editing the registry to enable the add the DelegateSentItemsStyle registry value is not an option, you can add the additional accounts to the profile as IMAP accounts, then select the account when composing the message. If you have Outlook 2010, an IMAP account is not necessary as you can add additional Exchange mailboxes to your Outlook profile as additional Exchange accounts. Note that this is not recommended for users with delegate permissions to the mailbox. These users should use either the DelegateSentItemsStyle registry key (or after sending rules) or create an IMAP account. Right click on Preferences key and select New, DWORD Value. 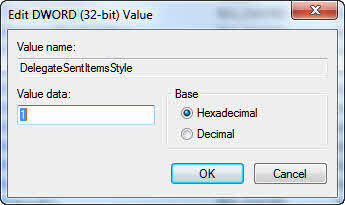 Double click on DelegateSentItemsStyle to open the Edit dialog then type 1 for the Value data and close the dialog. SAM automatically sets the sender, signature, and folder for sent items based on several criteria. Use SAM to assign a sending account or SendOnBehalf address and signature to contacts, folders, or categories. Works with Outlook 2007, 2010 and Outlook 2013, 2016. I have an exchange 2016. When user is sending an email from the shared mailbox with BCC the sent email goes to her personal mailbox and the shared mailbox. But the BCC only shows in her mailbox not to the shared mailbox. We tried to install registry keys and resetup the Outlook. It works the email now goes to the shared mailbox and she can now see the BCC. But she also wants to see it on the own sent items. Any suggestion? Would rule is the only fix? I'll need to test it. A rule should solve the problem though. not work any longer for him. Do you hane any clue what went wrong? If you remove the key and restart outlook, does send on behalf of work again? It shouldn't affect it at all and sounds more like permissions were changed on the server that affected it. could fix it. I checked the permission of the mailbox user and it was correct. the shared address was outdated? That will do it - delete it and reselect it from the GAL (i would use the gal, not the offline address book). I'm using Group Policy to push the DelegateSentItemsStyle registry entry, and it is working. I have a question though regarding the customizing of the view settings. When I add the Changed By field in the shared mailbox, the field does not display my name as the sender. It displays the shared mailbox name. I was assigned Full Access permissions to the shared mailbox via the Exchange server and was not delegated permission. Is delegate permissions required in order to have my username appear in the Changed By field? When you have full access, your account is an owner and you act as the mailbox. You would need to have on send on behalf of permissions instead to see your name in the sent folder - either applied alone or in delegate permissions. Just wanted to drop and and thank you for the info here. Really helped me sort out a head scratcher on our exchange/outlook. Also made the up front staff happy. Vaguely related; when I click the From: dropdown when composing a new email, I get a list of the real email accounts configured in Outlook, and I get the ability to manually type an Other Email Address to put in the From: of a particular message that I compose. Usually, Outlook remembers these Other Email Addresses, so I can see them in the From: dropdown in future and not have to re-type them every time. I've recently fresh-installed two of my systems, with Windows 10 and Office 2016. On one of them, Outlook 2016 does remember my Other Email Address and show it to me in the From: dropdown ... but on the other it doesn't remember. I've done some research on this and not quite found the answer (see https://social.technet.microsoft.com/Forums/office/en-US/6ad4c9a9-48d1-454b-be07-62e39275dfe7/outlook-2016-remember-other-email-address-from-dropdown-for-future-emails?forum=Office2016ITPro ). Can you comment? Why wouldN'T Outlook 2016 on one particular installation remember a manually entered Other Email Address? How can I force Outlook 2016 on that computer to remember the other address? Well, it should remember the ones you added. This is stored in the registry so it sounds like the registry is not getting updated for some reason - do you have any addins or applications that access outlook data and could be preventing it from closing cleanly? Does it keep the list if you add it manually? (use the correct account key - if you added the same accounts in the same order, the account key should be the same on both systems). If this is registry issue, how to fix? There are normally two reasons why it doesn't remember - wrong permissions on the registry (it shouldn't be this if other settings stick) and the address is mistyped. Is there a way to make a user default to send as the shared mailbox, by them clicking reply/reply all from within the shared mailbox? And for it to use the correct signature? BTW thanks for this post, haven't tried it yet, but I wanted this functionality with the sent/deleted items folders. If you have send permissions, replies and forwards should use the correct account - new messages won't but you can use a macro to do this. If the shared mailbox is mapped, not added as a new account, the signature won't change automatically but a macro can change it. If you create an “Additional Mailbox” but on a different Exchange Server, what happens when your initial (or primary Exchange Server) goes down? So site “A” has you Exchange Server and your personal exchange account. Site “B” has a Group/Shared account. You setup your personal account with the Shared ‘group’ account that is at another site (let’s say Site “B”). If site “A” server goes down. Obviously send/receive from your personal won’t work, but can you send emails from the Group/Shared account? I ask, because the Group/Shared account ‘feels’ like a child account of the primary/personal exchange account. Also, does the “Send As” make a difference for this scenario? I have not tested this scenario - I'm going to say it wouldn't send because it's dropped in your outbox. Send as won't matter, because it still uses your mailbox's outbox. The registry entry works a treat and when a new email is sent from Outlook 2013 (Windows 7 & Exchange 2010 SP1) as a 'send on behalf', it goes to the 'on behalf' sent items. However, my client does a lot of 'send to-mail recipient' emails from pdf/excel/word files but it always goes to their own personal sent items rather than the 'on behalf of' sent items. Is this a design feature or am I missing something? Has anyone else noticed this behavior? if you are sending using an application's file, send to command, i don't have a workaround for it. Still nothing solved or workaround about this ?